Well before Gisele, the Super Bowl rings, and MVPs, Tom Brady was apparently just a regular dude, who worked at parks and golf courses. Evidently, Brady might turn into the next Wolf of Wall Street. Two years as an intern at Merrill Lynch. Regardless of what happens with the Gisele marriage, we’re not going to wake up in 30 years with Brady being broke. He’s going to light cigars with $100 bills for the rest of his life. Seriously, how great does “Tom Brady, Course Ranger” sound? That sounds like a bad 80s sitcom. Can you imagine Brady yelling at people not to leave beer cans on the course? Just wonderful. He studied Business and Psychology. No basket-weaving and puppetry for him. Not too many Joe Blows can top Brady’s “Additional” section. How many dudes are playing quarterback for a Big 10 school and leading to a bowl victory? Of course, he appears to be modest about it. 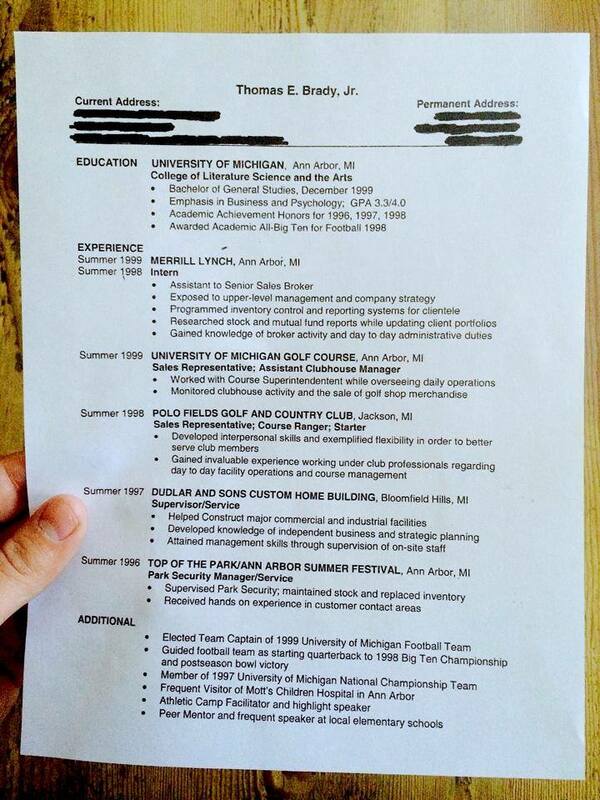 Overall, the résumé itself isn’t too flashy and not too long. Very readable and probably good usage of a Microsoft Word template on his part. Quality social media post, Mr. Brady.